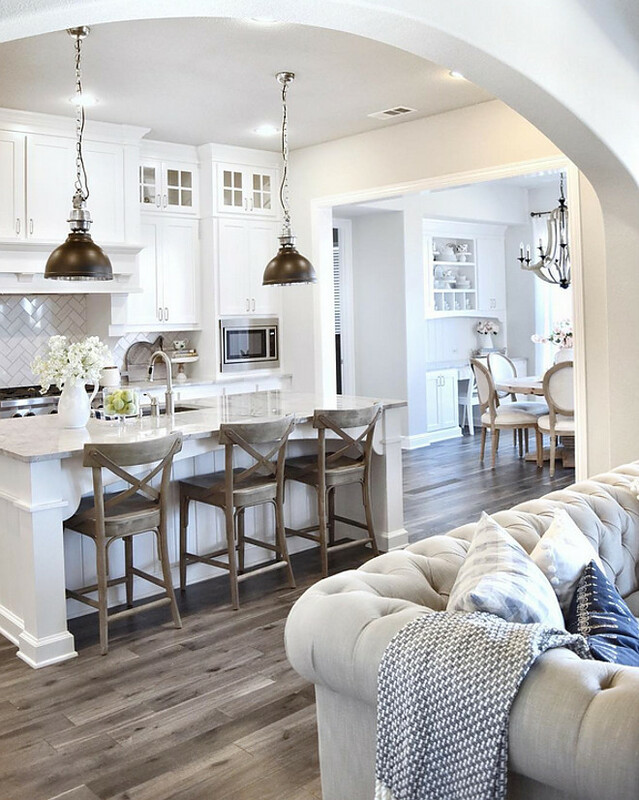 Taking a few minutes to do what you love should be part of your daily life and, for me, seeing inspiring interior design ideas is one of the things that I don’t compromise on. 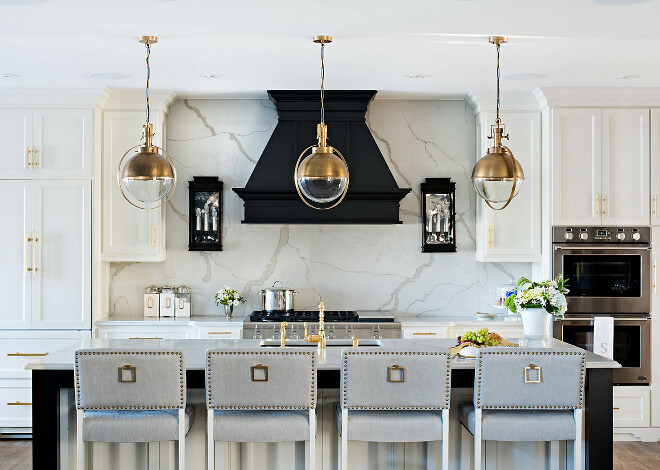 This post is full of great interiors from interior designers and architects I admire and talented homeowners I follow on instagram. 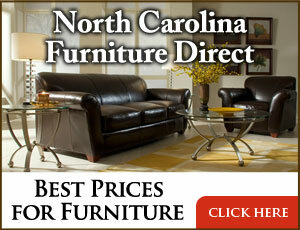 You will find a vast collection of kitchen designs, bedroom designs, bathrooms, living rooms and much more! So grab a fresh cup of coffee, find a quiet spot, and dream on! 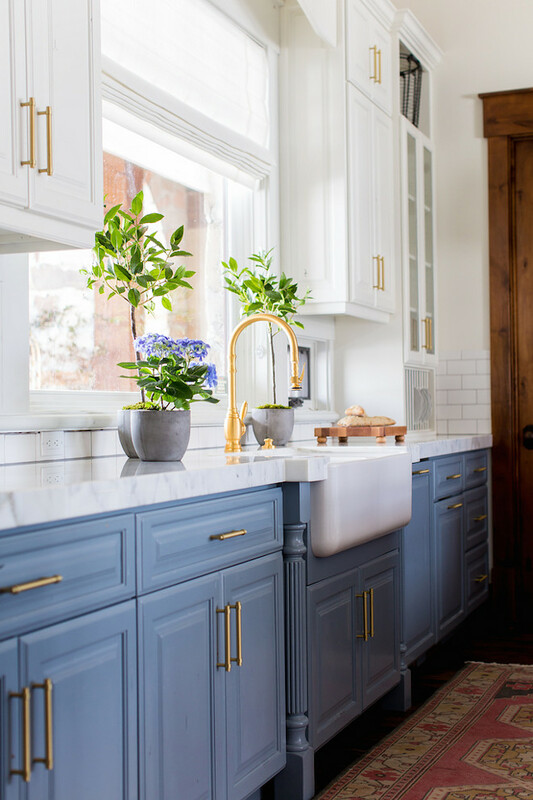 Two-Toned Farmhouse Kitchen: According to the designer, the inspiration for this project was a modern farmhouse with rustic and industrial elements. They wanted the kitchen to feel clean and crisp. 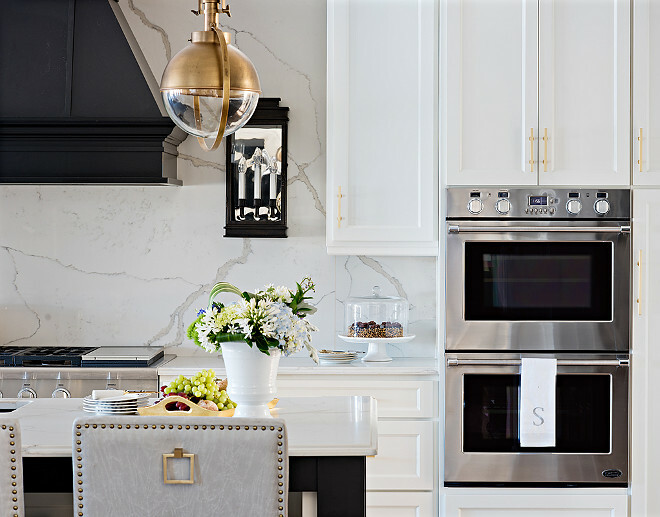 To keep the kitchen bright, they went with white subway tile backsplash, beautiful Calacatta marble counters with a mitered edge and two-toned cabinets. Becki Owens & Jamie Bellessa. The blue cabinet paint color is “Benjamin Moore HC-145 Van Courtland Blue”. White upper cabinet and wall paint color is “Benjamin Moore Swiss Coffee”. 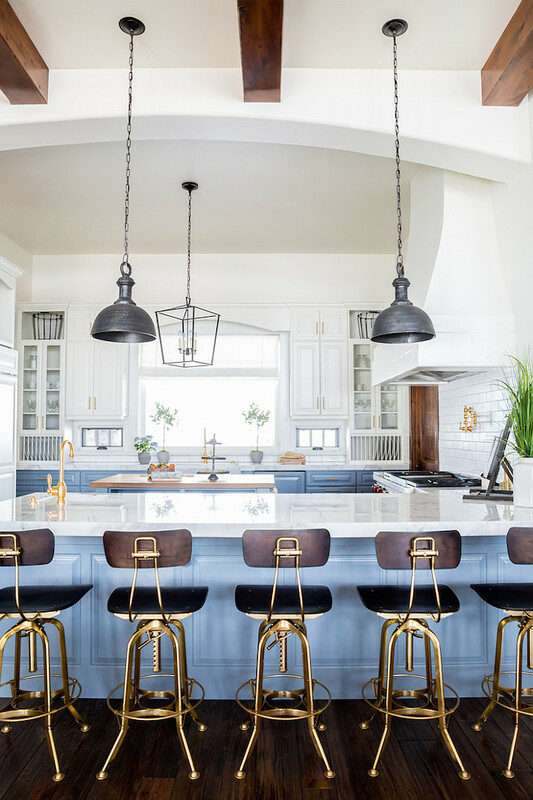 Kitchen stools are from Restoration Hardware. 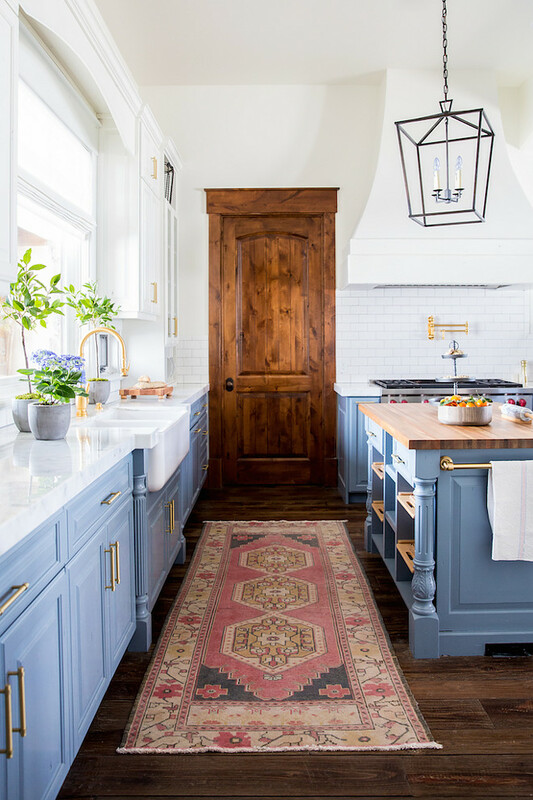 Kitchen features a vintage kilim runner. 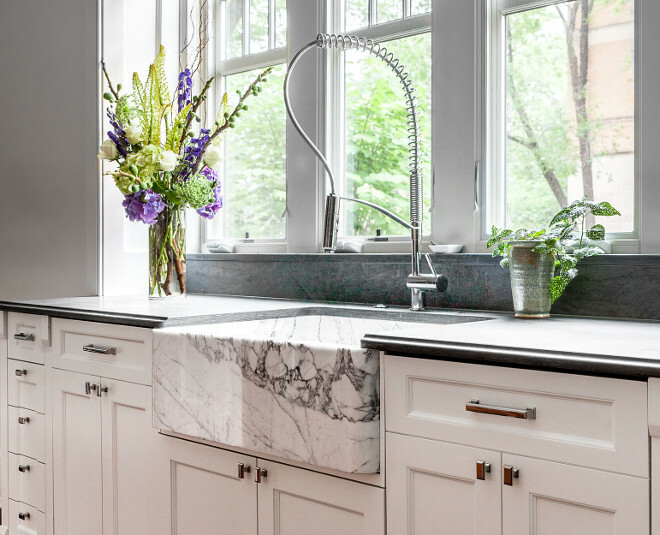 Countertop is polished Calacatta marble with a mitered edge. 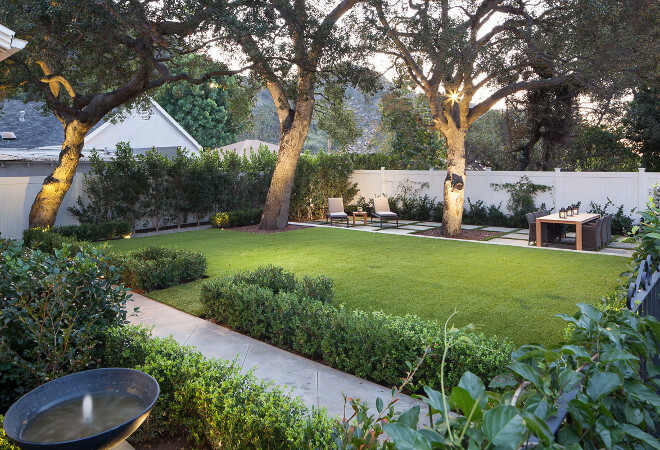 See the complete house tour here! 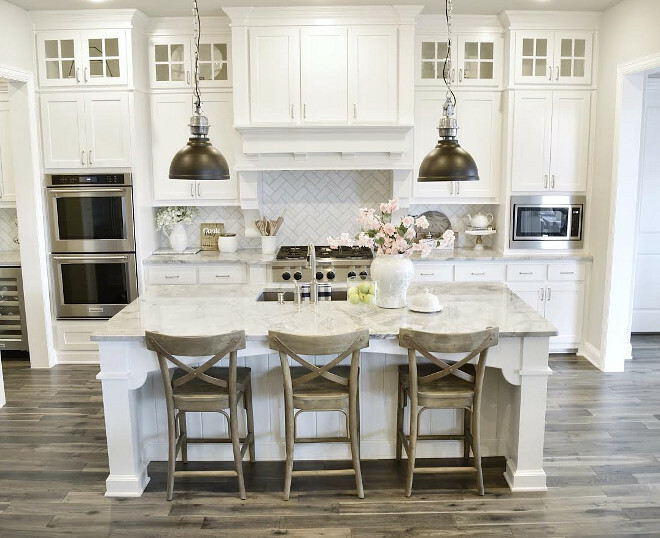 White Farmhouse Paint Color and Flooring: White kitchen paint color is Sherwin Williams Pure White. Farmhouse flooring is Kentwood Floors engineered oak wood floors. Style is called Oak Iron Springs and the color is Wild Thing. The kitchen stainless sink is Blanco Silgranit single bowl sink in Metallic gray. Faucet is by Moen. 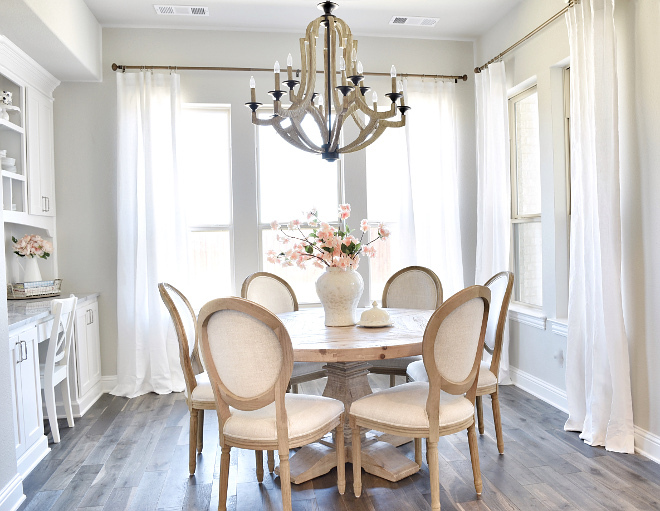 Farmhouse Breakfast Room Chandelier: Jeremiah Winton 12 light chandelier. 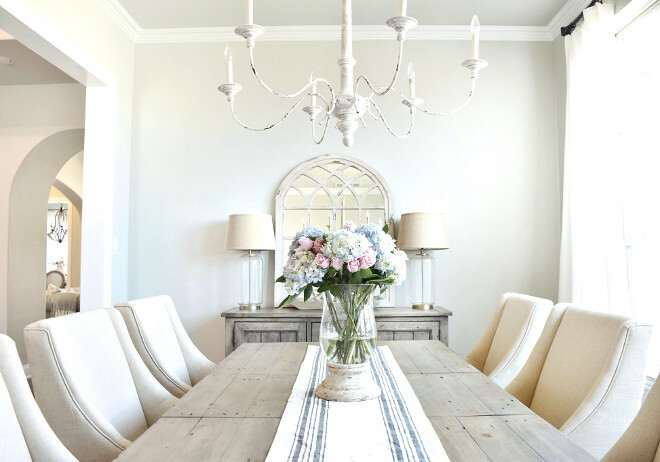 Gorgeous neutral farmhouse dining room. 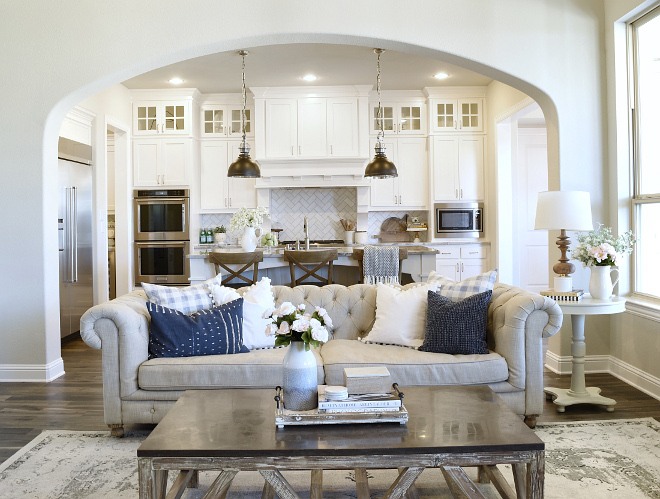 The distressed French chandelier is from Visual Comfort. 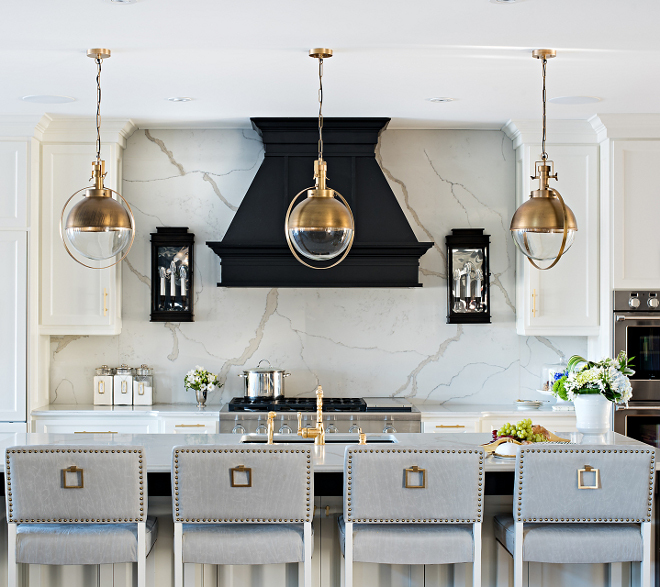 The kitchen cabinets are painted in Benjamin Moore Swiss Coffee and the black hood paint color is Benjamin Moore Onyx. 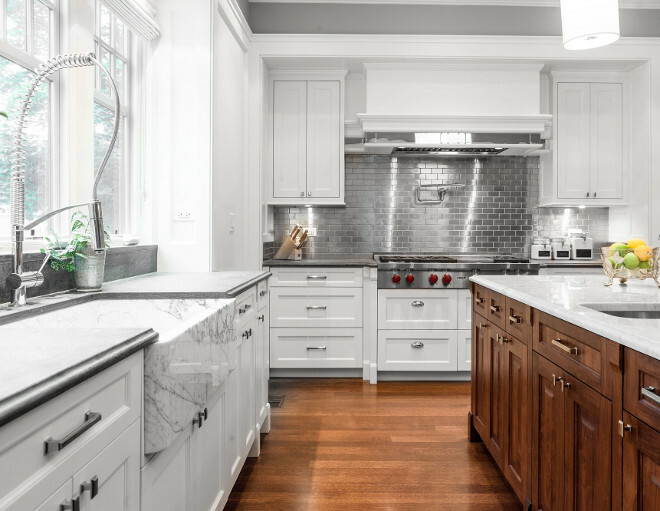 For the countertops, the designer selected a stunning quartz. 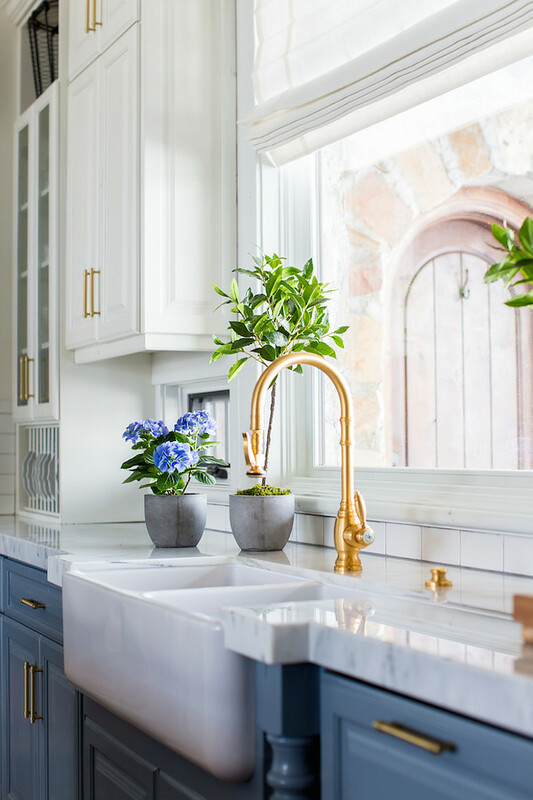 “I knew I wanted to mimic marble, but marble isn’t the best choice for busy people and families in their kitchens because it’s porous and stains easily.” She loved the quartz so much that she decided to use it above the range too. “Swiss Coffee OC-45 by Benjamin Moore”. 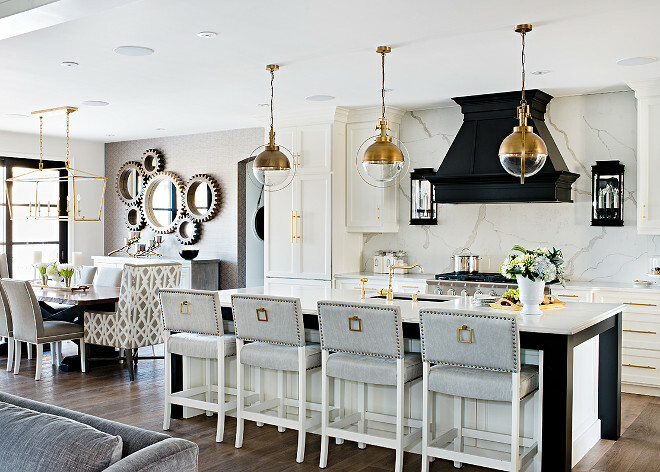 Kitchen features brass and glass orb pendants. 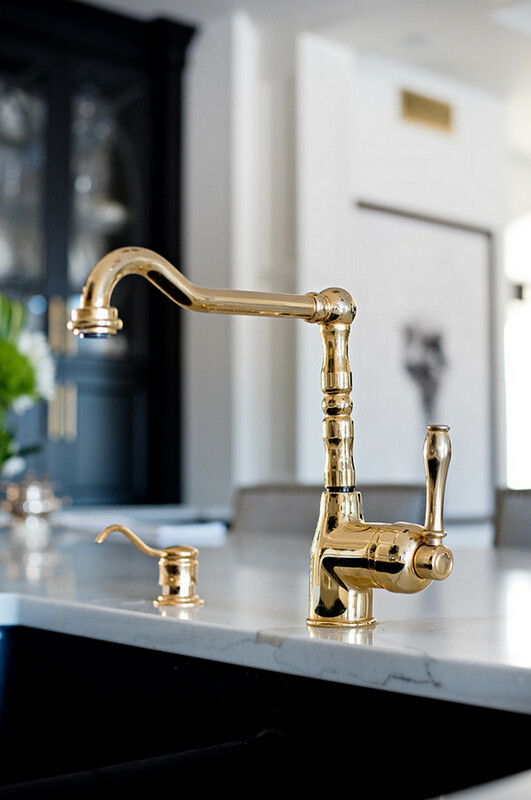 Kitchen features polished brass faucet, black sink and marble-looking quartz countertop. Family room with black built-in cabinets painted in Benjamin Moore 2133-10 Onyx. Cabinet paint color is “Benjamin Moore 967 Cloud White”. 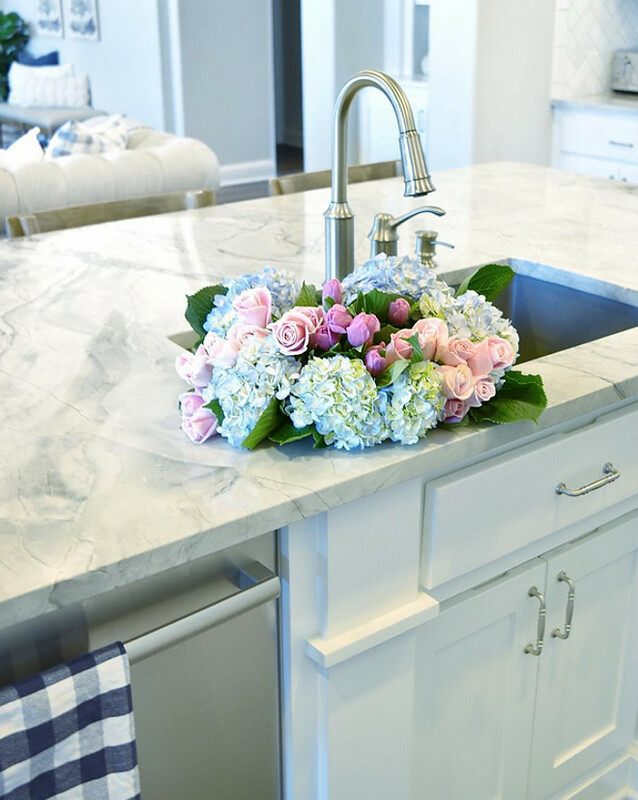 Gorgeous stone farmhouse sink and leathered countertop. 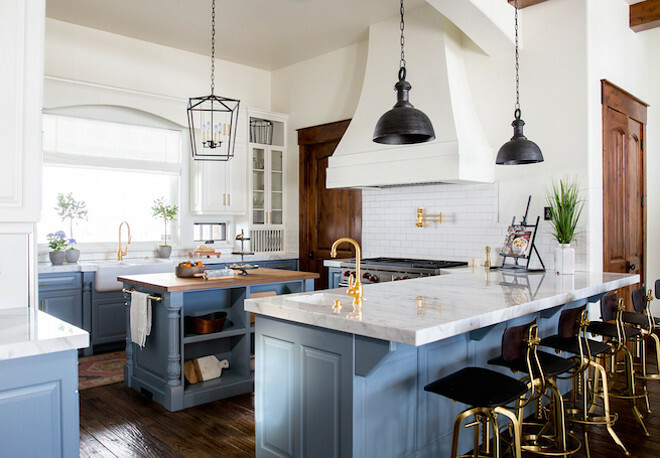 “Benjamin Moore HC-166 Kendall Charcoal” is a favorite grey paint color for kitchen islands. The main cabinets are Benjamin Moore OC-27 Balboa Mist. 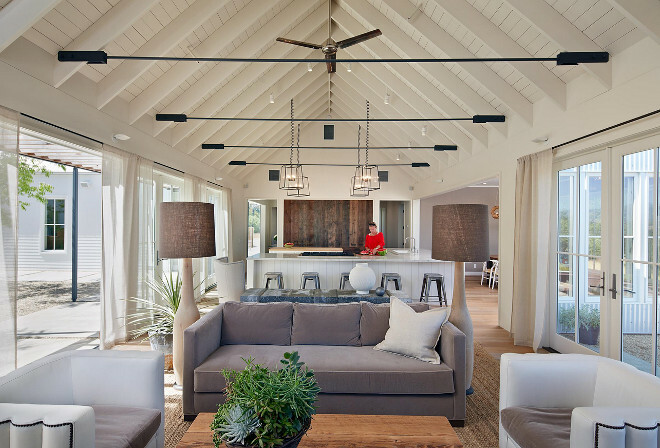 Open living room and kitchen with vaulted ceiling and exposed rafters. The rafter brackets were fabricated by a local steel worker per spec from the structural engineer. Rafters are 2×12’s at 24″ on center – construction grade painted white. The roof pitch is 10:12. Paint color is “Benjamin Moore OC-17 White Dove”. The French doors are are Marvin Clad Doors. The fireplace stone is slabs of black slate. Hardwood floor is Mirage Isla White Oak. 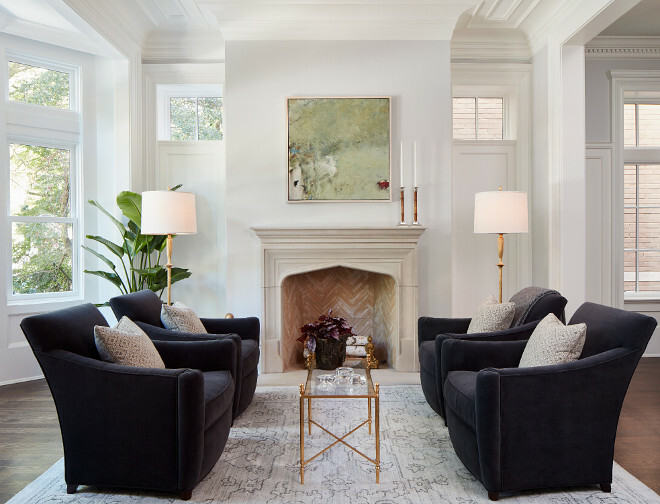 Classic white living room with herringbone fire brick and limestone surround fireplace. The black doors are steel and are made by a company called “Hopes”. The door is about 39″ – sidelightes about 21″. The black wall paint color is Benjamin Moore Onyx. White trim paint color is Benjamin Moore Swiss Coffee. 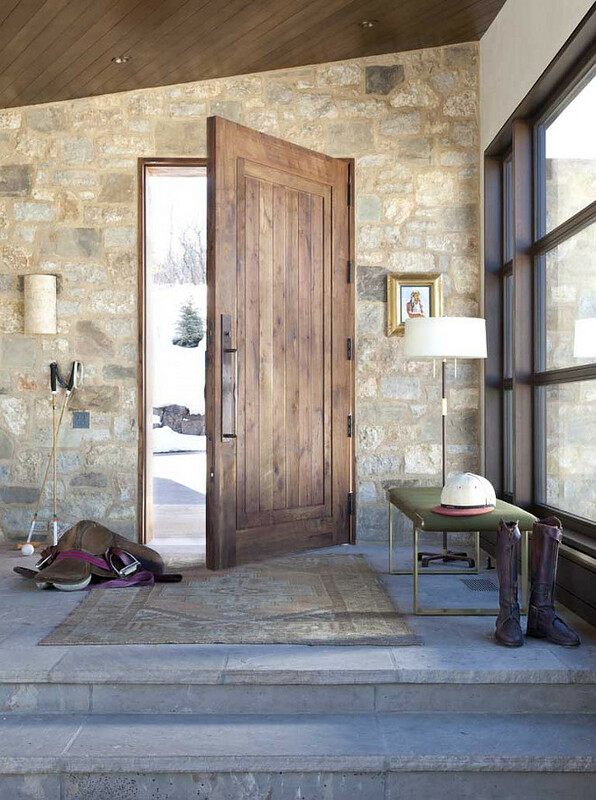 Rustic foyer with stone accent wall, rustic stone flooring, large windows and wood paneling ceiling. 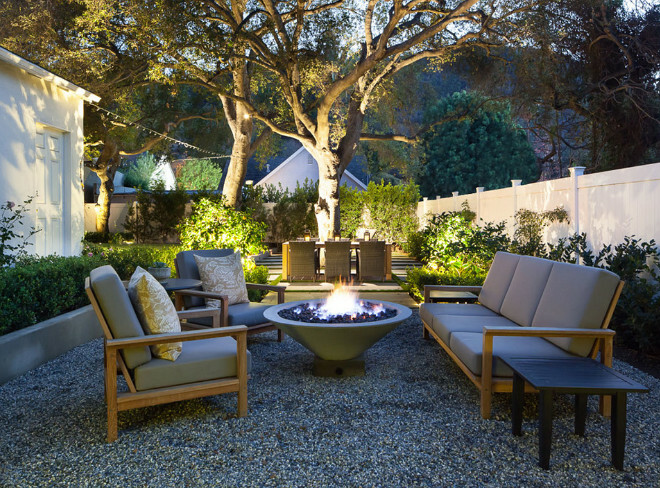 Andrea Lawrence Wood Interior Design. 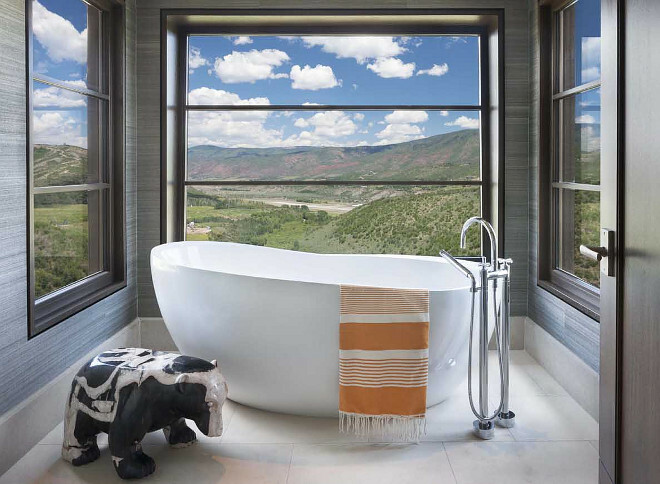 Bathroom nook with black steel windows. Kids playroom with wet bar. This wet bar is perfect to store the kids snacks. 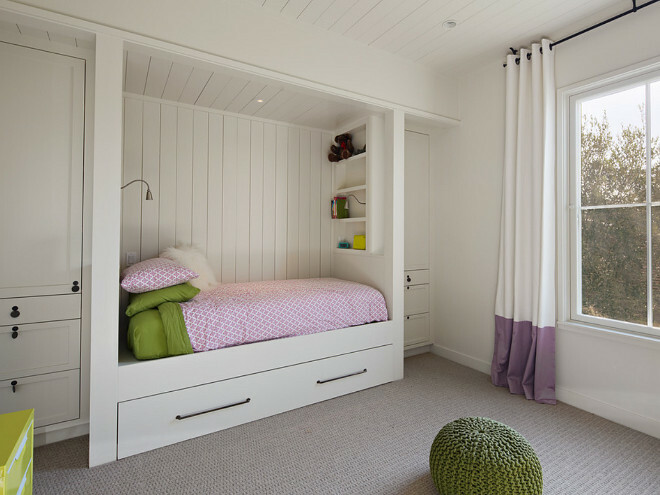 Built in trundle bed with vertical shiplap and built-in wardrobes on the sides. Dimensions: 12’x12′. The ceiling height is 9′-6″. The vertical shiplap are individual 1×6 boards with an eased edge. The cabinets are Benjamin Moore Dove White and the marble countertop is honed. 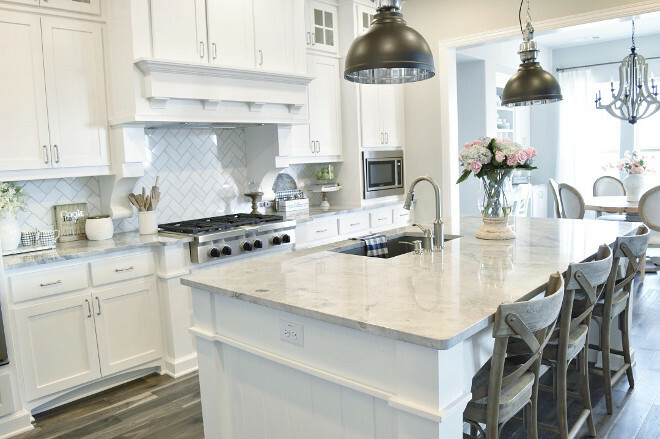 The backsplash is 9″ tall and it is made from 3/4″ thick marble. Sink is a Century 48″ sink. The vanity is 9′ long. Faucets are Kohler Purist Cross handles. 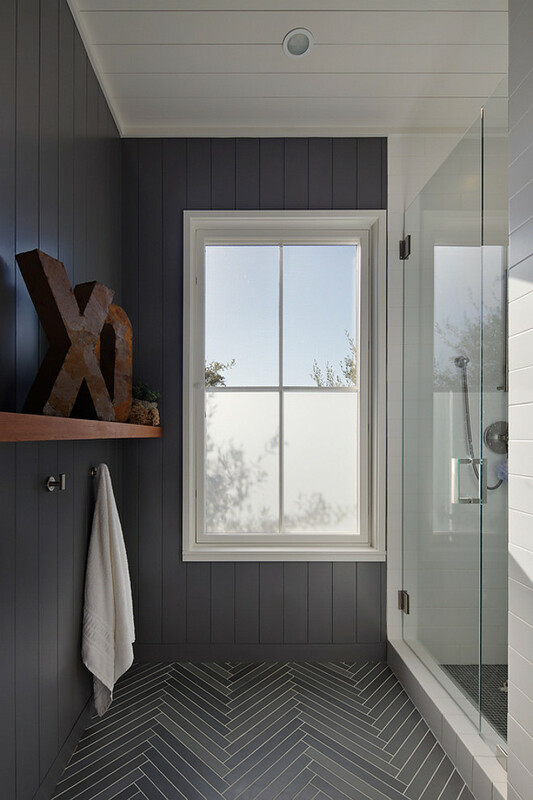 Bathroom features vertical shiplap and limestone herringbone tile. The tiles are about 1 1/4″x 12″ each. Paint color is similar to “Benjamin Moore Graphite”. 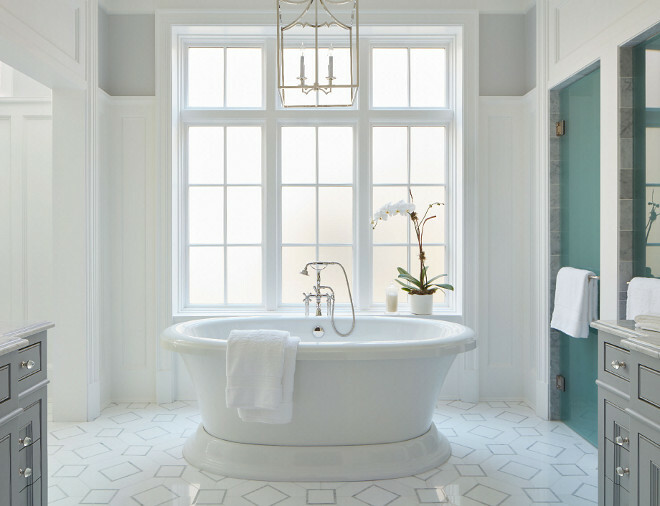 Classic master bathroom with freestanding bath and grey vanities. 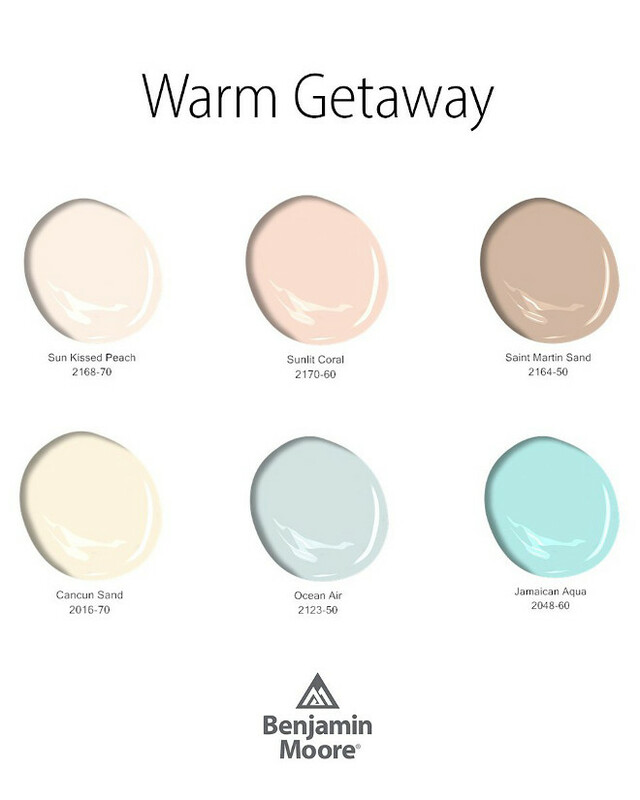 Benjamin Moore Pastel Color Palette: Benjamin Moore Sun Kissed Peach. Benjamin Moore Sunlit Coral. Benjamin Moore Saint Martin Sand. Benjamin Moore Cancun Sand. Benjamin Moore Ocean Air. Benjamin Moore Jamaica Aqua. Blue Paint Colors: Dark Blue paint colors: Benjamin Moore Deep Royal. Benjamin Moore Hale Navy. Sherwin Williams Anchors Away. Gray Blue Paint Colors: Dunn Edwards Blue Steel. Benjamin Moore Blue Heather. 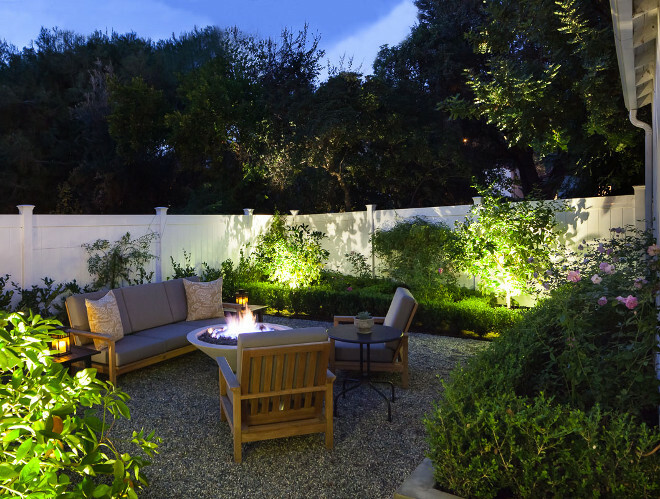 Sherwin Williams Gibraltar. Light and Fresh Blue Paint Colors: Sherwin Williams Aviary Blue. Behr Peek a Blue. Benjamin Moore Iceberg. 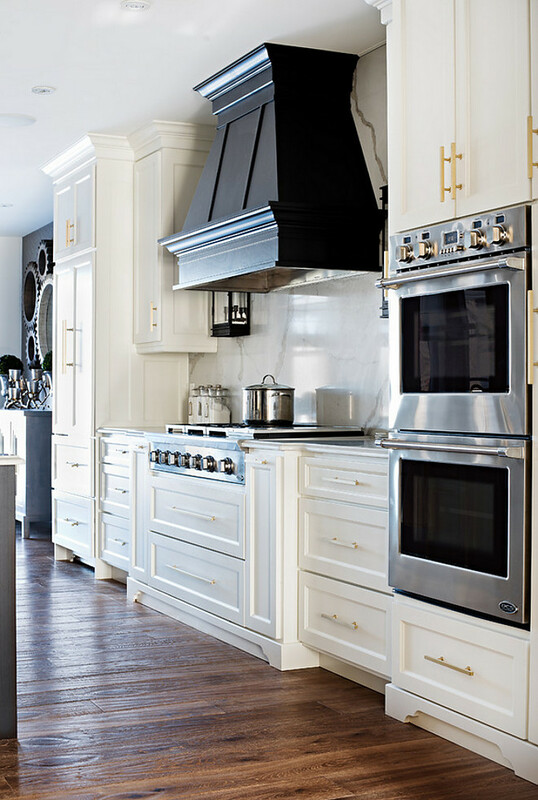 Fool-Proof Cabinet Paint Colors: White Dove by Benjamin Moore. 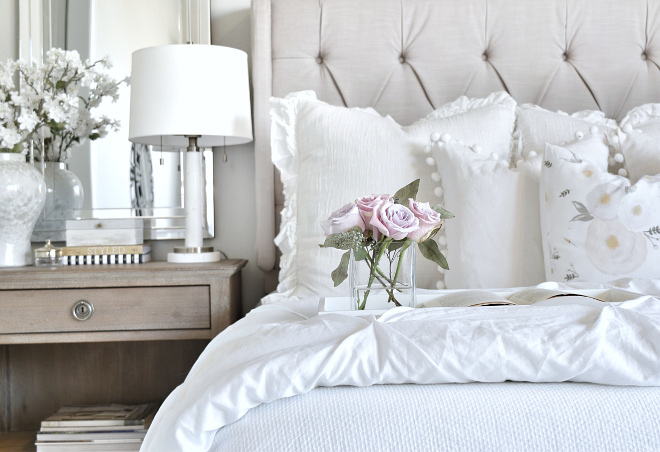 Simply White by Benjamin Moore. Navajo White by Benjamin Moore. White Tie by Farrow and Ball. River Reflections by Benjamin Moore. 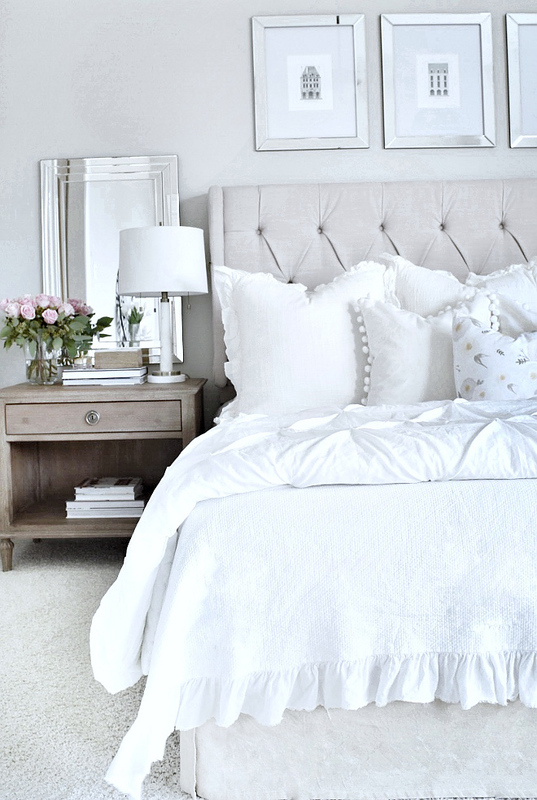 Gray Mist by Benjamin Moore. 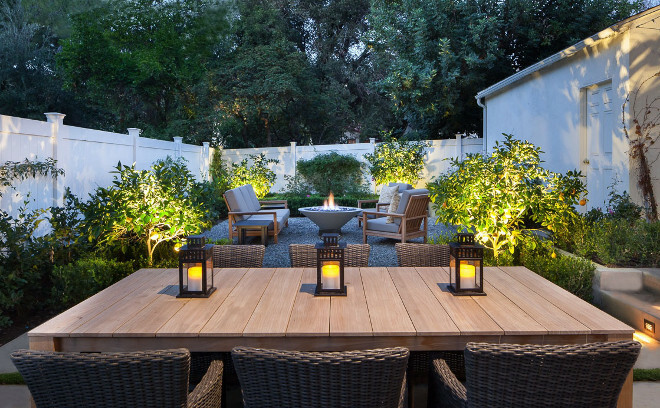 Fieldstone by Benjamin Moore. Chelsea Gray by Benjamin Moore. 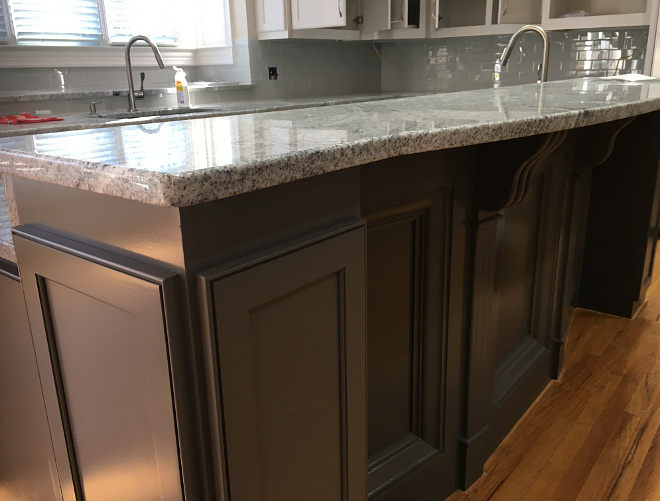 Granite by Benjamin Moore. Pigeon Farrow and Ball. Chatroom by Benjamin Moore. Enchanted Eve by Benjamin Moore. Hague Blue Farrow and Ball. Mightnight Blue by Benjamin Moore. 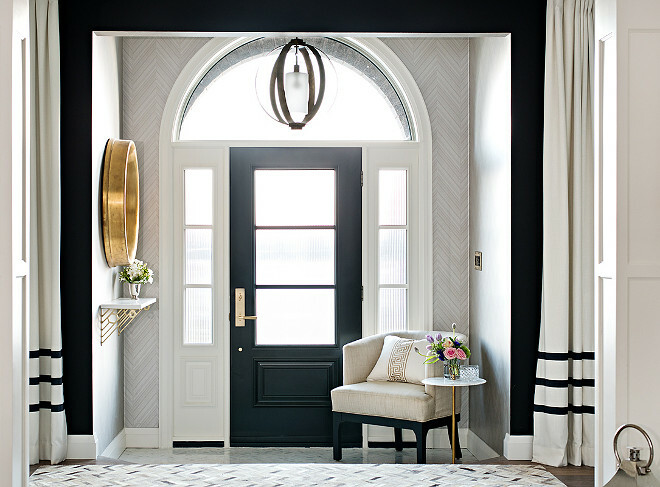 Hale Navy by Benjamin Moore. 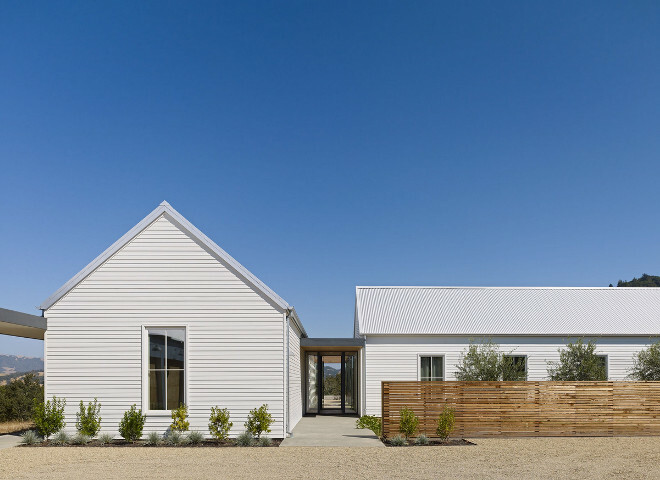 Modern Farmhouse Siding: Siding is Hardie Board lap- square edge – primed. The metal roof is called corrugated Galvalume – it is better that standard sheet metal – it will last for a long time – excellent roof. 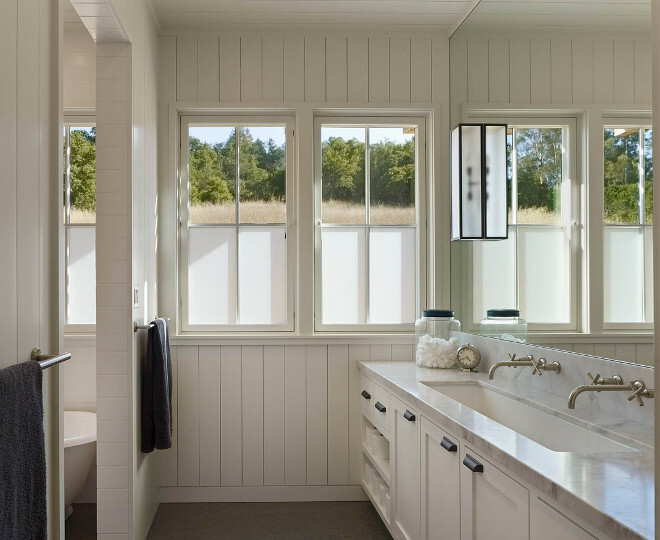 Windows are all Marvin casement windows – clad on the exterior with wood on the interiors. 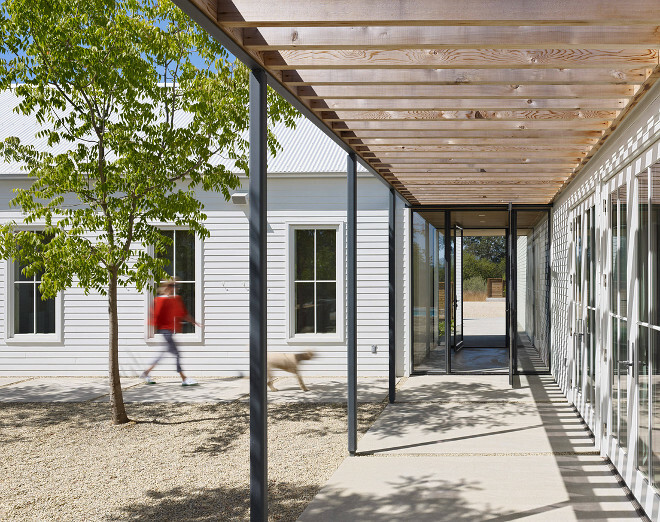 The entry of this modern farmhouse features a shade structure made of open cedar trellis and steel posts. 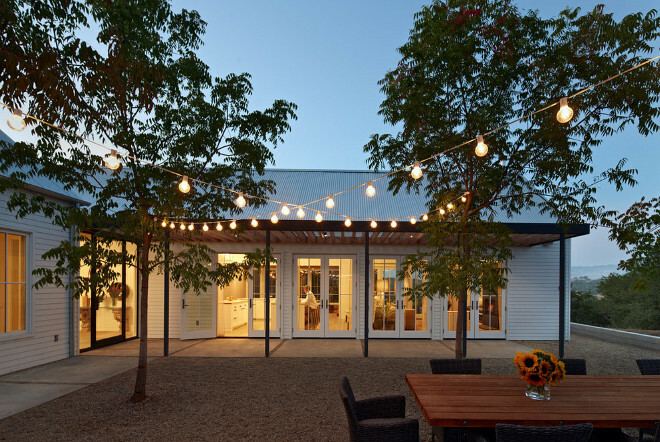 Modern farmhouse with gravel backyard. 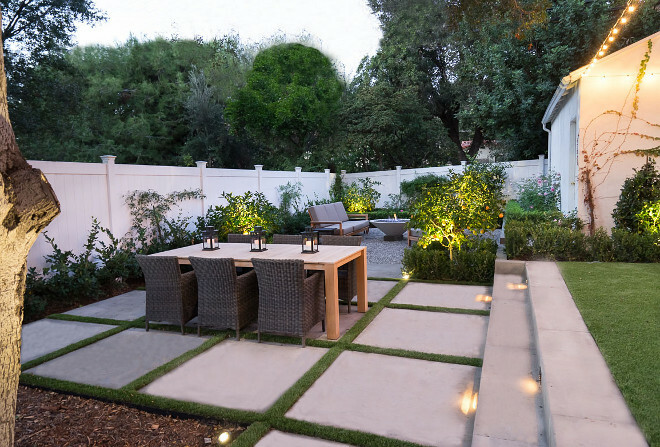 Gravel Backyard Tip: Some gravel is very smooth and some is sharper – so you would have to pick the grave carefully from a garden supply or building supply source. 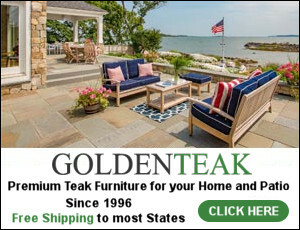 Trees are Chinese Pistache– good medium size tree with great fall color. 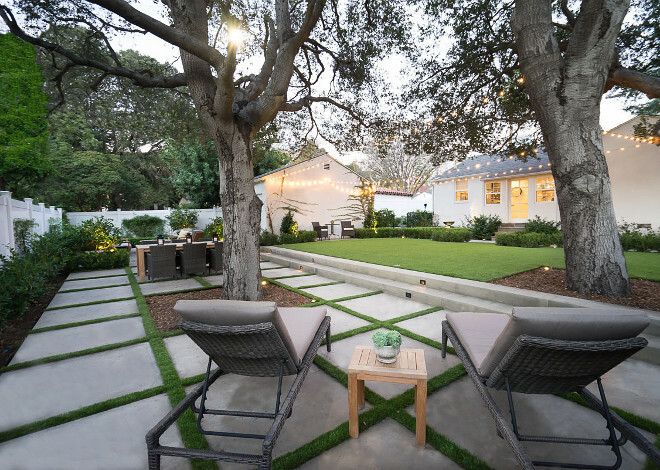 Tuesday: Classic Shingle Home with Beautiful Interiors. Wasn’t this a fun post? I really hope you had a good time here today. Things are going well. I’ve being thinking a lot about my life, about the good things. I’ve always tried to analyze, to learn, to focus, to find a reason for everything, but the more I live I understand that we don’t need to stop and analyze every detail. To complete understand your heart you simply need to feel the moment. We often tend to complicate and ask too much. We need the details, we want answers and this tend to not only drive us nuts but also to waste precious moments – moments that we could be living, smiling more and enjoying life. Learn to simplify your life through simple actions. Don’t overthink – in fact, don’t overdo anything! Be lighter! Be more free! 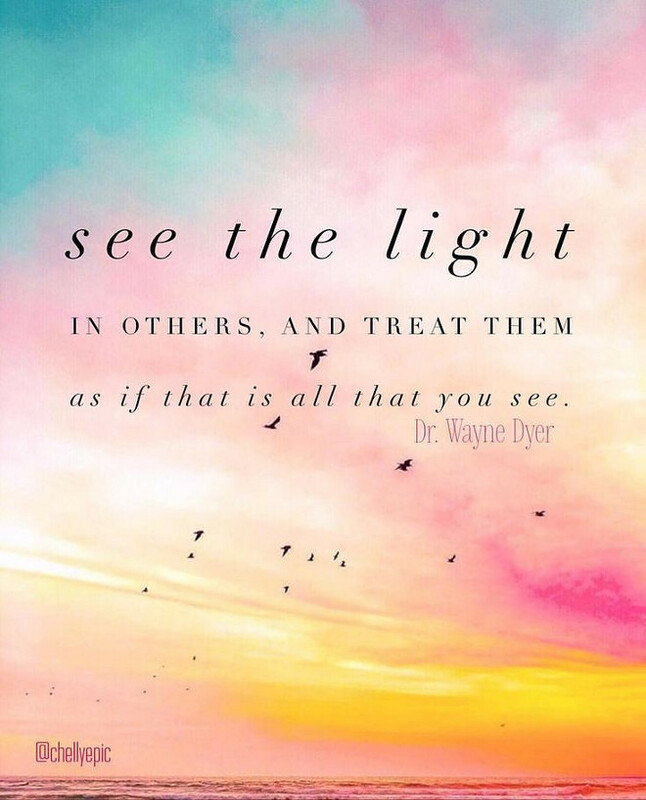 Know that you are already perfect, that you already carry an inner Light that can shine a room! 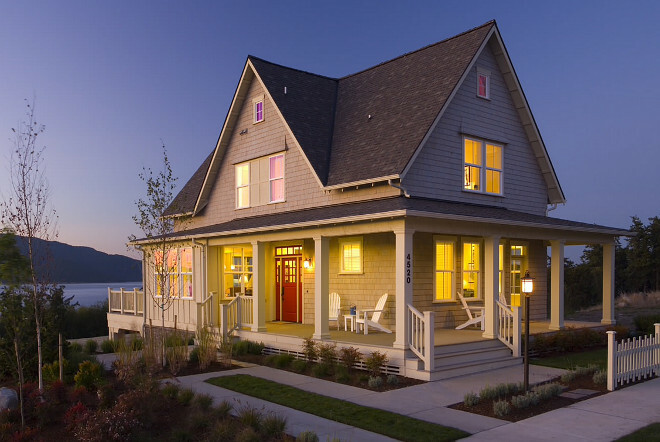 Sources: 1st Image: Union Studio, Architecture & Community Design (Photo: Courtesy of Gilbane Development). I’ve have receive your blog , but it stop coming in my mailbox????? I’m not sure why this happened. 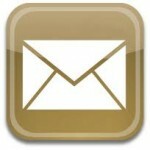 Please try to sign up with a new email.